A team of Peruvian archaeologists excavating the archaeological complex of Huaca Bandera on the north coast of Peru (about 800 miles from Lima) have uncovered a ceremonial hall used by the the pre-Columbian Moche civilization for human sacrifices. The Moche civilization flourished between the 1st century B.C. and the 8th century A.D. The ceremonial hall dates to the 6th century A.D., which means that the Moche were still practicing human sacrifice even at the end of their civilization. 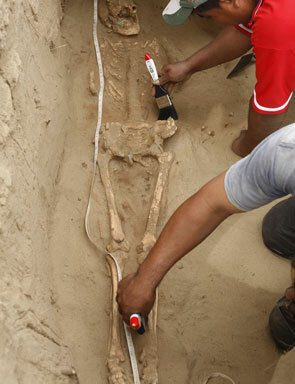 Carlos Wester La Torre, director of the Bruning Museum in Peru and a leader of the dig, said the ceremonial site likely hosted ritual killings of prisoners of war. Photographs taken at the site show more than half a dozen skeletons on the floor of the hall. “There was a great ceremonial hall or passage integrated into the rest of the architecture that establishes the presence of certain figures of the Moche elite and also the practice of complex rituals such as human sacrifice,” Wester told Reuters. His team uncovered a 60-meter-long (197-foot-long) corridor opening up to face three equidistant porticos and five thrones on the archaeological site’s main pyramid. Behind the altar are the remains of a mural with colorful designs of 3 highly ornamented figures. Their ornamentation and the objects depicted on the mural indicate they are senior dignitaries, most likely political leaders, involved in the sacred ceremonies of human sacrifice. One of the dignitaries is female, from her ornaments probably the high priestess. The Moche were a culture of farmers and potters, so unlike the Inca Empire that followed them, the Moche left few large ceremonial halls like this one behind, and this is the only one that dates so late in the civilization’s timeline.